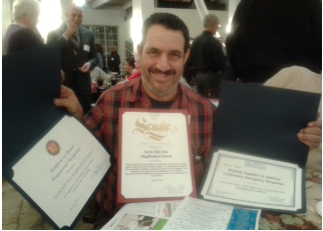 The Valley Alliance of Neighborhood Councils (VANC) celebrated their 15-year anniversary last night with their annual “Best of” Awards, which honors the great work of the 34 Neighborhood Councils in the Valley. With a video welcome from LA Mayor Eric Garcetti, who was in New York at his college reunion, and City and State elected officials and City department heads like Councilmembers Paul Krekorian, Mitch Englander and Bob Blumenfield and Board of Public Works President Kevin James in attendance, the evening was festive with a standing room only capacity. Congratulations to the VANC for achieving 15 great years, and to the winners of this year’s “Best of the Valley” Awards! Read about the amazing work of this year’s VANC Award winners below, and check out the event photos by Saul Daniels. 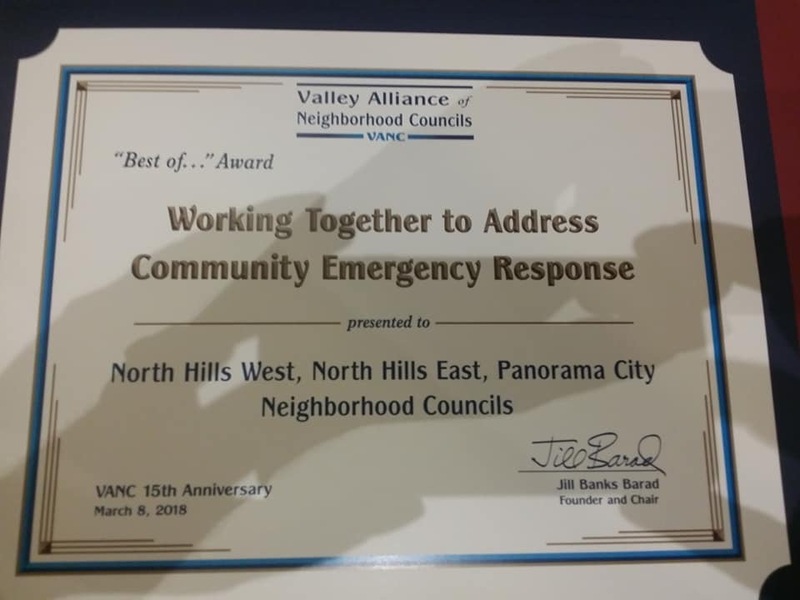 “Best of…Working together to address Community Emergency Response” – North Hills West, North Hills East and Panorama City Neighborhood CouncilThe program to train Community Emergency Response Teams (CERT) is a critical part of the City’s preparedness program. CERT volunteers provide local help in an emergency when first responders are overwhelmed. The Los Angeles Fire Department provides this training for volunteers for free. Three Neighborhood Councils serve an area of the Valley that has many Spanish-speaking families. They partnered to plan and recruit volunteers for CERT classes that would be taught in both English and Spanish. The English class has graduated (with perfect attendance) and the Spanish class will begin soon. The Spanish class will be an innovative partnership between the LA Fire Department and a newly trained Sergeant from the LA Police Department’s Mission Division. The Fire Department no longer has funds to provide graduates with a “CERT kit” to hold their emergency equipment. These three Neighborhood Councils worked with a non-profit organization, the Southern California Preparedness Foundation, to pool funds to provide these CERT kits to benefit their communities. The Foundation, which sponsors the annual Valley Disaster Preparedness Fair, obtained a grant from the Southern California Gas Company. This grant was used to match City funds provided by the three Neighborhood Councils through Neighborhood Purposes Grants. CERT kits have been distributed to the English class graduates and the kits for the upcoming Spanish class have been reserved. 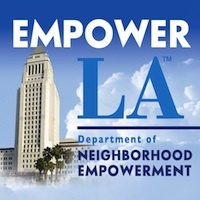 Congratulations to Panorama City Neighborhood Council, the North Hills West Neighborhood Council, and the North Hills East Neighborhood Council for winning this award for the best example of a creative partnership with a private organization to enhance City funding for community benefits, and for exemplifying local Neighborhood Council teamwork.